The Netgear Orbi is one of the fastest and most reliable wireless routers on the market today, making it absolutely worth the high price of admission. 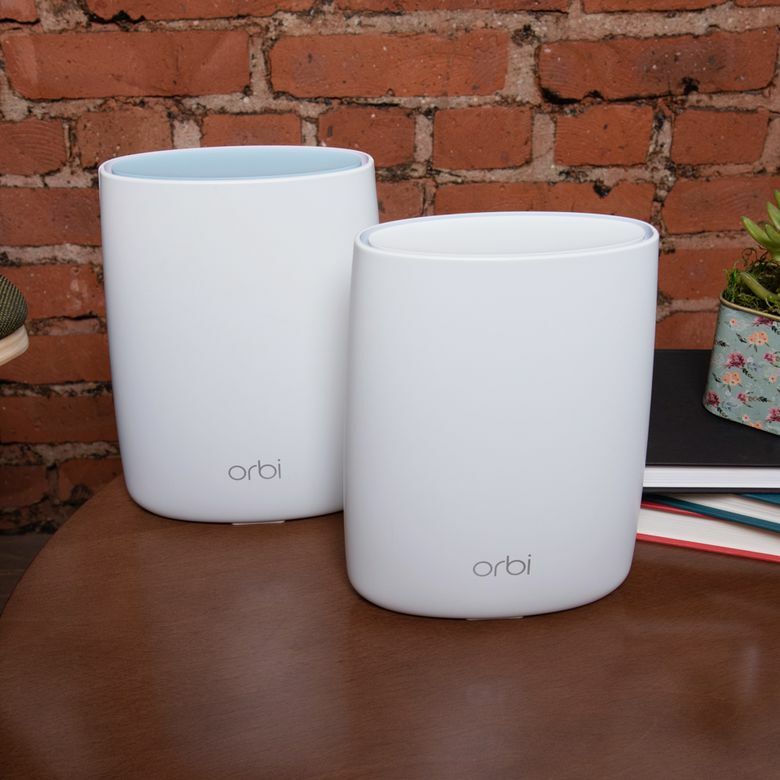 If you have a large home or office that you need to cover, mesh Wi-Fi routers like the Netgear Orbi are the best option in 2019. Due to their modular nature, you can cover greater areas without relying on a mish-mash of wireless extenders. However, these options—including the Netgear Orbi—are usually much more expensive than your traditional router. We’ve been testing the Orbi to evaluate whether its speed, range, and design live up to the price tag, and whether or not it deserves a place in your home. You will have a hard time finding a better wireless router than the Netgear Orbi. Unlike a vast majority of wireless mesh routers on the market, the Netgear Orbi is big. At 8 inches high and 6.4 inches wide, it’s not going to blend into the background like the compact Google Wifi. But, that’s not necessarily a problem. The Orbi has a beautiful white design, that’s free of illumination except for when something is wrong, making it look more like a piece of decor, rather than a wireless router. All of the ports and buttons are on the back, so if you manage your wires correctly, it becomes rather attractive. This attention to detail and design serves two purposes: it eliminates the need to search for an inconspicuous corner of your home to shove it, which in turn boosts performance by being out in the open. Something has to be said about the quality of life improvements brought by smartphones. Setting up the Netgear Orbi was as simple as downloading an iOS app and scanning some QR codes (there’s also an Android app). We just had to plug it into our modem, open the Netgear Orbi app, and follow the prompts on the screen. Setup did take a while to finish, taking about five minutes to detect the satellite, rather than the nearly instant setup from some other mesh units out there. However, once setup was complete, our 250Mbps Xfinity connection was seamless, though there were some weird connectivity issues we ran into which we’ll discuss later. These days, it’s becoming increasingly common for network management to take place primarily on a smartphone app. This is great for most users, as it does away with the need to fish through arcane network gateway software. The Netgear Orbi is similarly set up and managed through an app, but unlike the competition, it still allows for advanced controls that get simplified on other devices like Google Wifi. The router also features robust parental controls thanks to a partnership with Disney. The Orbi lets advanced users access the same old kind of network gateway you’re used to, and allows adjustment of just about any setting. This is particularly helpful for anyone that has to deal with a lot of network interference, as you can manually adjust your wireless channels. The router also features robust parental controls thanks to a partnership with Disney. When paired with the Orbi, the Circle: Smart Family Controls app will let you control your family’s online time from blocking off-limits websites, managing screen time and even setting a bedtime so your kids don’t stay up playing on their phones all night. Whether you’re an experienced network admin or someone looking for something that just works, the Orbi will suit your needs. The Netgear Orbi is a forward-looking wireless router, and there’s no getting around that. Every aspect of the connectivity from the AC3000 speed rating, the wealth of Ethernet ports, and the Tri-Band wireless connections mean that it’s going to be a top-end router for years to come. However, you might run into some issues with older devices. The Netgear Orbi combines its 2.4GHz and 5.0GHz bands into one network, so we had problems connecting some smart-home gadgets—namely our garage door. We did eventually get it to work, but it took some digging around in the Netgear Orbi’s back-end. These settings weren’t available on the app. We had to navigate to the router’s gateway to play around with the wireless settings, fortunately, the Orbi still allows you to do this. This likely won’t affect most users, but it can be an issue if you have a lot of smart-home gadgets, so it’s worth keeping in mind. We also have to mention the wide variety of physical ports on offer, both on the router and the satellite. Each unit has three LAN ports and a USB-A port. This is a boon for anyone that has devices that need a hard-wired connection in an upstairs bedroom or office. If you’re paying for high-speed internet—like in the neighborhood of 200Mbps or more—you’re doing yourself a disservice by not picking up the Netgear Orbi. This is simply one of the most powerful wireless routers on the market today. We tested the speed in several areas of our home—upstairs, downstairs, the backyard, and the basement. The only time we saw less than 290 Mbps is when we walked to a neighbor’s house. Google Wifi is good enough for most people, but the Netgear Orbi beats it where it matters: sheer power. Netgear advertises the Orbi of having 5,000 feet of coverage, and while we didn’t break out a giant tape measure, that seems in line with what we got. You can have a gigantic home and still get reliable network performance throughout. If you're in the market for routers with an extended range, check out our other reviews of the best long range routers available today. The Netgear Orbi supports MU-MIMO (multi-user, multiple inputs, multiple outputs), which means that it’s almost impossible to bog it down by connecting too many devices. In order to test this, we grabbed a few laptops, tablets and phones in the living room where the Orbi was located and loaded up 4K video streams on all of them. None of them buffered, even for a second. Any of these accomplishments on their own would make for a great router. But, when you take the phenomenal range, speedy performance, and MU-MIMO support together in a package, it’s frankly amazing. You will have a hard time finding a better wireless router than the Netgear Orbi. It’s expensive, but the price is justified by the nearly unparalleled performance on offer. Yeah, the Netgear Orbi is expensive. The unit we reviewed will set you back $306 at the time of writing, for the router and satellite—though its MSRP is $369. And, if you need to add more coverage, you can pick up extra satellite units for another $249 for an extra 2,500 ft of coverage. It’s certainly more expensive than many other mesh routers on the market, but you’re getting a level of performance that is genuinely worth the price of admission. It’s impossible to talk about a wireless mesh router in 2018 without mentioning Google Wifi. Google’s approach to the mesh networking scene has made such a splash that it’s almost the de facto wireless router for most people. But, the Netgear Orbi is better in nearly every way. While you can usually find the Google Wifi on sale for around $250, it is still a $299 router, and the level of performance you gain with the Netgear Orbi is more than worth the $50-$100 increase in price. Google Wifi is good enough for most people, but the Netgear Orbi beats it where it matters: sheer power. A fantastic router with no compromises. Anyone that has a large home or office that needs a fast and reliable network connection will find a lot to love with this router. Even if your home isn’t 5,000 square feet, the speed and reliability that you get through the AC3000 connection and MU-MIMO support can’t be understated. Overall, if you’re looking for the highest possible level of performance from your wireless router, the Netgear Orbi is the way to go. Product Dimensions 6.7 x 3.11 x 8.89 in.